A while ago a guy from the Netherlands asked me for my 3D model of the Marchetti engine so he could make a working model. I've had a few such requests over the years and, although I'm happy to let people have copies, my cad models are for demonstration only so need completely reworking to make a real model. Wesley has completely reworked the Marchetti model , including figuring out a mathematical formula for the cams (I cheated, and used empirical methods to make my model 'work'), and has designed a compressed air version. That's a jolly complicated mechanism I wonder what advantages it was supposed to have over a more conventional design? A cam has the advantage of slowing the crank speed for a given firing rate (each piston completes all four strokes in one revolution ) so potentially giving more power while removing the need for a gearbox. The main problem for this, and the similar Caminez engine, is that the large reciprocating mass verses the relatively low rotating mass of the crank and prop causes a torsional vibration that is/was difficult to control in a light aircraft. Thanks for posting those animations! Always fascinating to see 'new' (to me) mechanisms. I love the mechanicalness of it all and how the inner working are exposed. Will Wesley offer up his model? I would love to have a go at it. According to CF Taylor The Caminez concept should have died before drawing board. It ran well on stationary test stand and vibrated test aircraft to pieces . Aircraft never rolled under own power. What should have been done first was to make a torque analysis or simulation and that would have shown that the prop shaft reaction had an enourmeous second order variation and that vibrated test aircraft. If made as two row i e 8 cylinder and the two funny figure 8 things had been skewed 45 degree to each other could have solved this problem. I think but am not quite sure. >Aircraft never rolled under own power. "The Fairchild-Caminez 447 was first flown in an Avro 504 from Farmdale, Long Island, New York, in 1926. 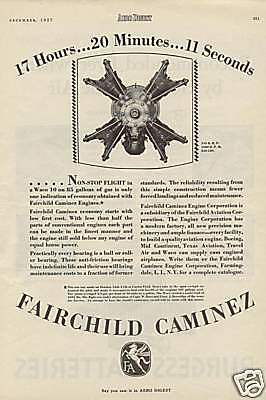 It was successfully endurance-tested in 1927, and was the first ever axial engine to receive a US Dept of commerce type certificate. " It is good that I do not give financial or political advice for money. Wesley has made some progress. He's been having all sorts of problems with the accuracy of his cnc mill. It seems the previous owner was less than careful with it and has damaged an axis in some way (Wesley didn't elaborate) . With that fixed, he has remade the Cams using his own mathematically derived formula and they look better than ever. The collage summer recess has slowed Wesley's progress, but he is continuing his build. Attached is a picture of his cylinders: he's going to make a working pair (with pistons, valves etc.) as a test prior to making the full set of eight. Lovely work on the model. This is an interesting adaptation of the slave exhaust valve concept. Sizing the slave valve spring correctly will be important. In general a weaker spring is best, with a wire size of .010" - .012". In the past, I've wound my own springs by using a 4-40 or 6-32 socket head cap screw as a mandrel. With the screw chucked in the lathe at a slow speed, the spring wire will follow the threads for even spacing. Of course, you need to pick a screw that will yield a spring of the right size. Also, the ball used for the slave valve should be a loose fit in the exhaust port.